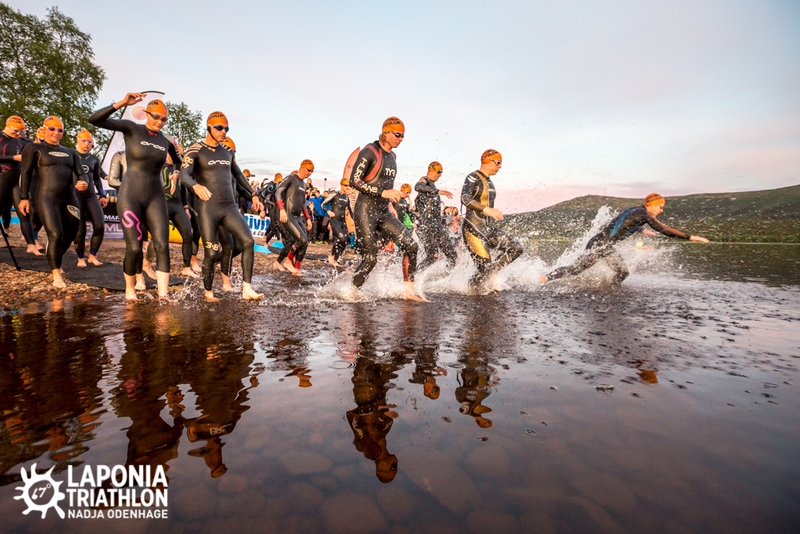 The Laponia Triathlon is a long distance triathlon with 3860 m swim, 180 km bike and 42.2 km run. The maximum time to finish the race is 18 hours. 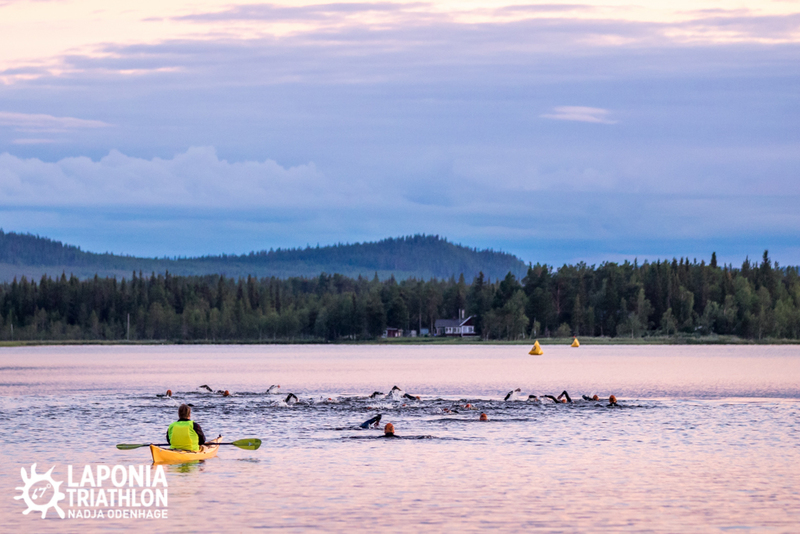 The swim is a three-lap course in lake Vassara which is located near the central parts of Gällivare. 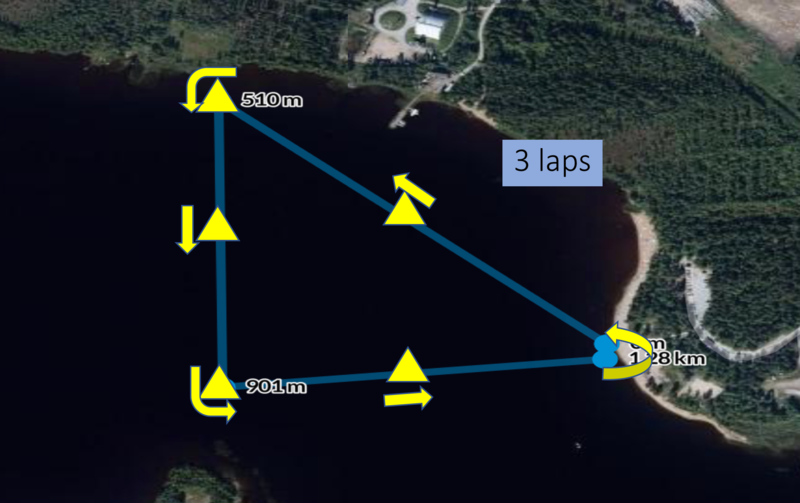 Between the three laps there is an Australian exit on the Sandviken beach which is a popular beach for swimming and other sports activities. Water scooters and snowmobiles (yes, also on non-frozen water!) are also quite common on lake Vassara. The swim start is at midnight but up here above the Arctic circle, the sun is over the horizon all night so there will still be daylight during the entire race. Water temperatures can vary quite a lot but colder than 16 degrees Celsius are uncommon as are temperatures above 20 degrees. 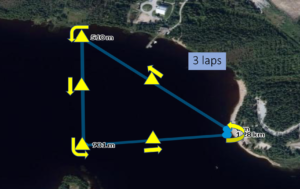 The maximum time to finish the swim is 2 h 15 min. T1 is next to the Sandviken beach, just a few meters away from exiting the water. Your T1-bag with your bike gear shall be placed by your bike and before you remove your bike from the bike rack all your swim gear shall be placed in the T1-bag by your place at the bike rack. All gear must be placed inside the T1-bag which shall be closed. The only things allowed outside the T1-bag are helmet and shoes which may be mounted on the bike. The T1-bag will be transported to the finish line by the race crew. 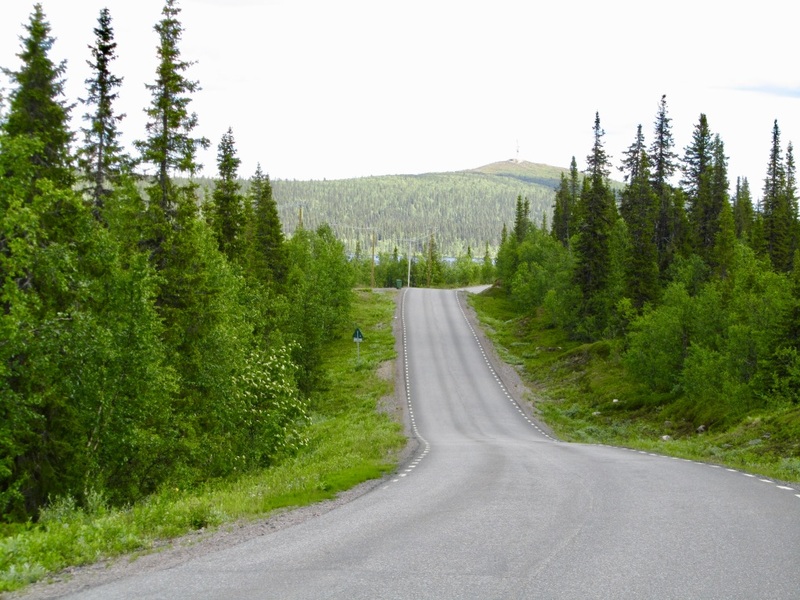 The course is essentially a two-turning-point course with the first turning point up in the small village Tjautjas by lake Tjautjasjaure where the road ends and mountains start. 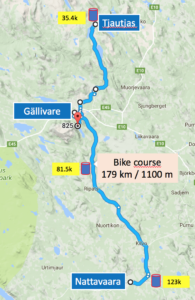 After the turning point the course heads back to Gällivare and onwards to the village Nattavaara, (in)famous for being one of Sweden´s coldest places with frequent temperatures below -40°C. 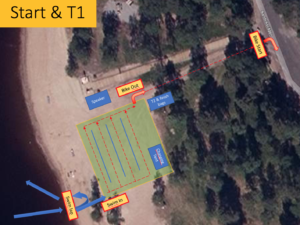 We do however expect warmer weather during the race but we will still provide a warming fire for the athletes in Nattavaara before heading back to Gällivare and T2 at Hellnerstadion, the cross-country ski stadium at the foot of the Dundret mountain. The stadium was named after the Olympic and World champion Marcus Hellner. 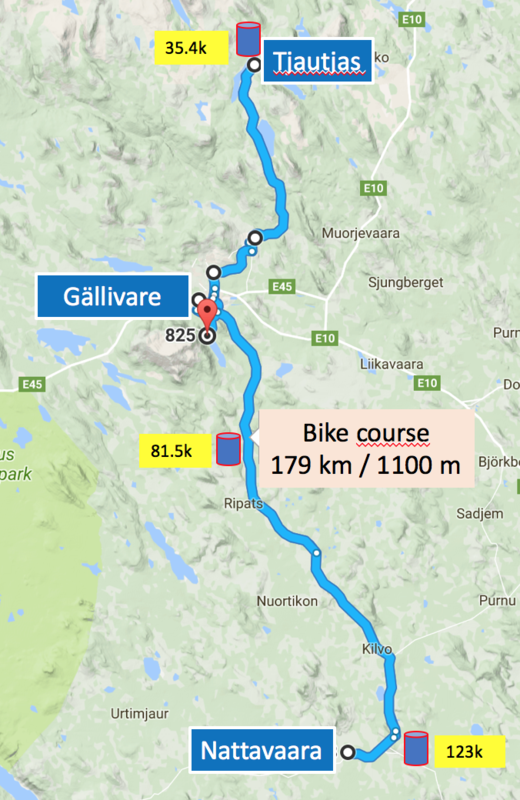 The first km on the bike will be on a small gravel road taking you over the river Vassara to the ”Other Side” neighbourhood turning left on the E45 towards the center of Gällivare. 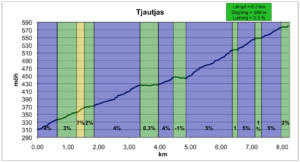 The road up from Koskullskulle to Tjautjas starts with an 8.2 km climb averaging 3.3%. 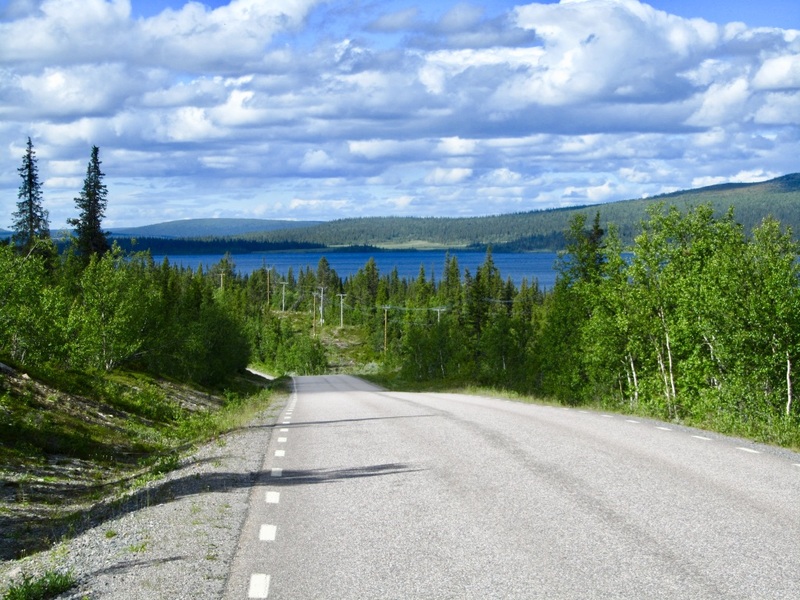 After this the road to Tjautjas is undulating but no long or really steep hills. 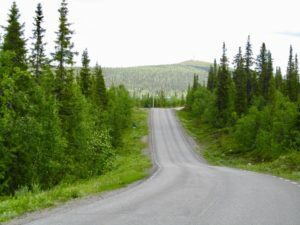 The turning point in Tjautjas is located where the road ends and you are surrounded by several mountain peaks above the tree line. 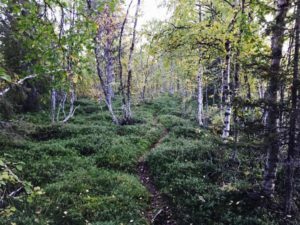 Tjautjas is sort of a gateway to the swedish alpine world with Kebnekaise (highest mountain in Sweden) only 100 km of pure wilderness away. 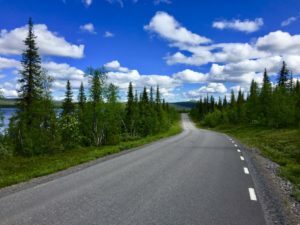 Arriving back in Gällivare you turn left into the road to Nattavaara. This road was repaved during 2017 and will provide a perfect surface for fast bike riding. The road is undulating but no long or steep hills. 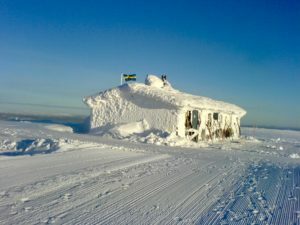 The turning point is located in small village Nattavaara. On the way back approaching Gällivare you see the Dundret mountain on your left. Apart from the first km the rest of the bike course is on asphalt. 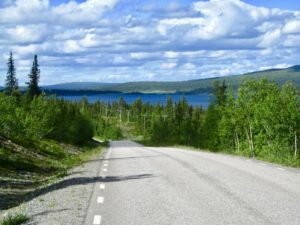 The road surface is generally very good but there are some minor potholes on the 8 km downhill heading back from Tjautjas. 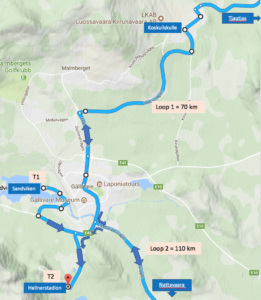 The roads are not closed for traffic but since the bike course is ridden during the night, traffic will be very limited. Still, all athletes must follow applicable traffic rules. The total elevation gain is 1100 meters. There are no steep long hills so no special gearing is needed. 39-25 as the lowest gear should be sufficient for everyone. Overview of bike course and the three aid stations. T1, T2 and start of loop to Tjautjas and to Nattavaara. 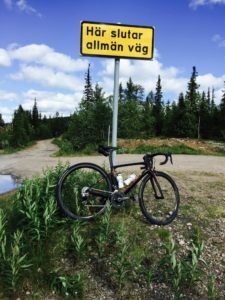 Wild life is rich along the course so even though traffic will be very limited you will have to pay attention to reindeers on the road. Bears and moose are also frequent in the area but are rarely seen on the roads. T2 is located at the Hellner ski stadium. The surface in T2 is gravel so you should keep your cycling shoes on until you put on your running shoes. When you enter T2, your T2-bag will already be placed next to your starting number at the bike rack. You leave your bike in the bike rack at your designated starting number, change to your running gear, put all your bike gear back in the T2-bag and leave the T2-bag next to the bike before entering the run course. 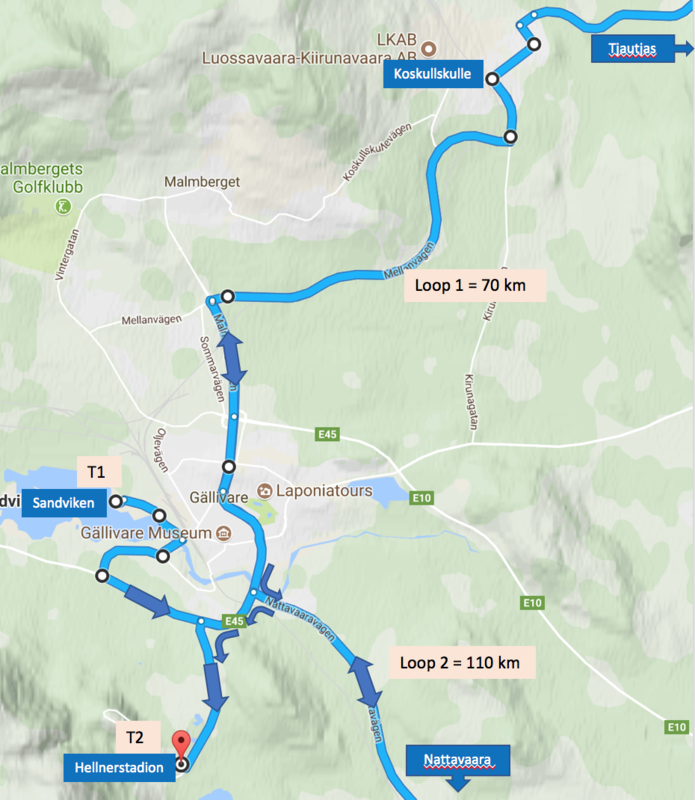 For more details about the bike course, check out the GPX-files for the first loop and second loop. The run course starts and ends at Hellnerstadion at the foot of the Dundret Mountain. 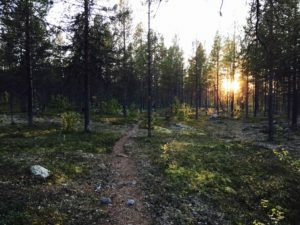 The name Dundret origins from the Sami word tuoddar. The course follows the base of the Mountain on a gravel trail for about 4 km and then turns right going downhill for 1.5 km to the national road E45. Once down at the foot of Dundret the course follows E45 for about 1 km and then turns right into a gravel road heading towards Rallarstigen, a narrow trail in beautiful surroundings. The trail has been an important means of transportation ever since the 1700’s. Workers used to carry heavy loads as the water power plants and dams were being build. 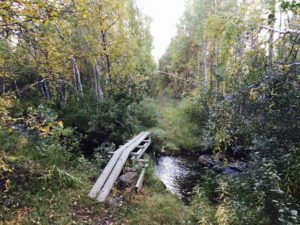 After about 6 km on Rallarstigen you turn right on a gravel road for about 2 km for the second and last turning point by lake Nietsak. 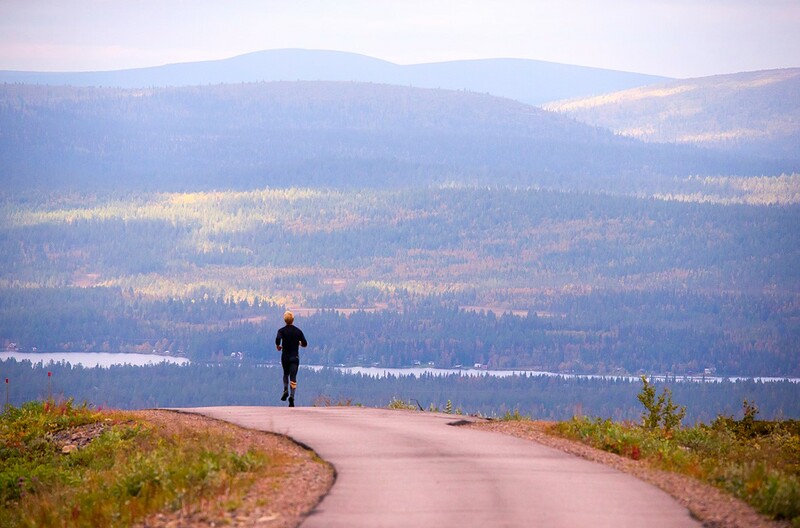 Head back along the gravel road up to E45 and you are rewarded with a 5 km downhill along E45. After 25.7 km the course turns right starting a long and tough climb up to the top of Dundret. 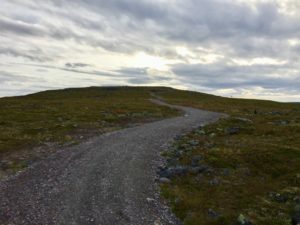 You will follow the small paved road for 5.3 km and then turn right up a gravel trail for the final 1.6 km to the top and a total climb of 44o m over 6.9 km. 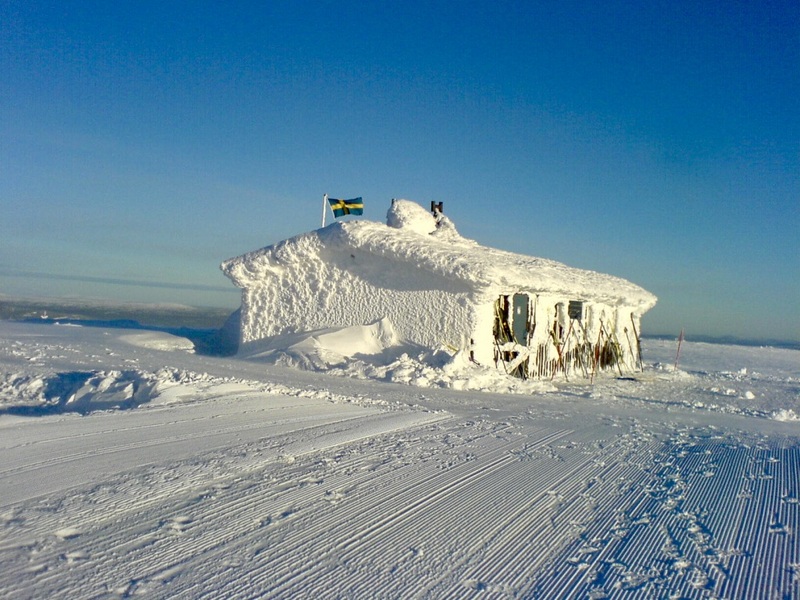 The turning point is at the top, 823 meters above sea-level at the cabin ”Åke på toppen” from where you on a clear night and day can see one eleventh of Sweden’s surface. At this point you have less than 10 km to go and 6 of them are downhill. On your way down you will have the impressive mountains of Sarek and Kebnekaise at the horizon. 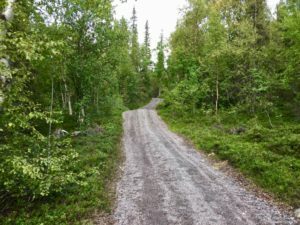 At 38 km you turn right, leaving the paved road and the last 4 km are on the same gravel trail as the first 4 km of the run course. You reach the finish at Hellnerstadion after 42.2 km and 800 meters of elevation. The initial and final 4k is a gravel trail. 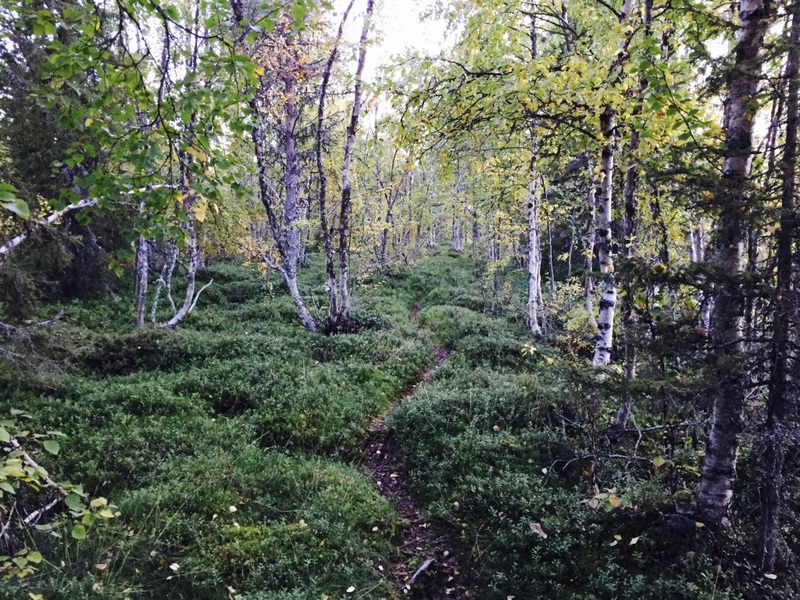 Gravel trail leading up to the ”Åke på toppen” cabin. 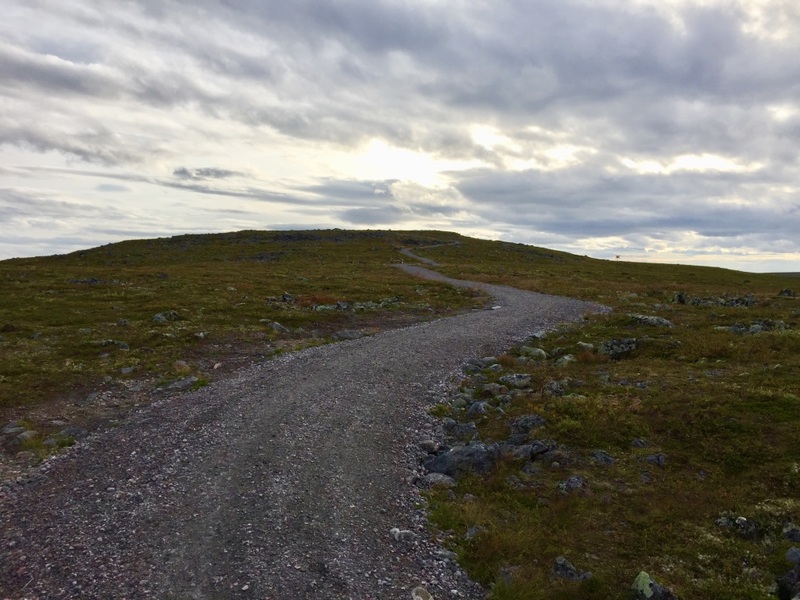 The spectacular view towards Sarek and Kebnekaise when running down from Dundret.